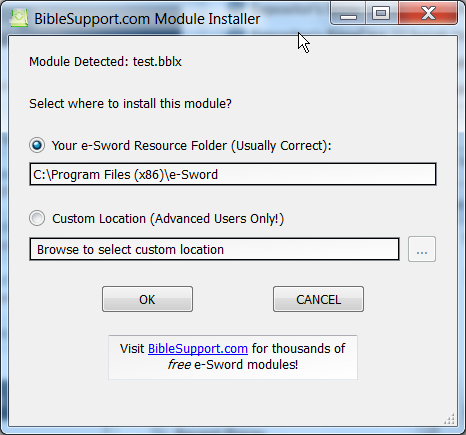 The e-Sword Module Installer automatically installs your e-Sword modules! 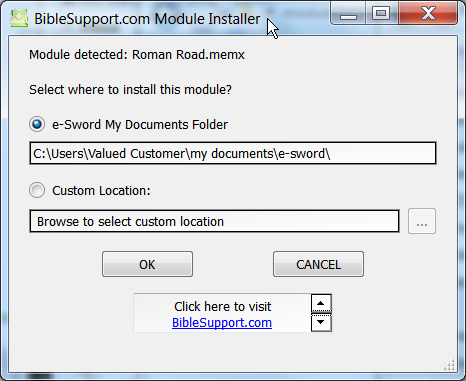 It copies your e-Sword module to your e-Sword Resources Location or User Files Location on your Windows PC. This works for e-Sword 9, 10, and 11. You can install modules from Windows Explorer, Internet Explorer, or Firefox. For a non-editable module, the Module Installer shows this screen (don't worry, all you have to do is click "OK"). For an editable module, the Module Installer shows this screen (don't worry, all you have to do is click "OK"). If you downloaded a zip file: double-click the zip file (or open it while you download the file, as shown below). 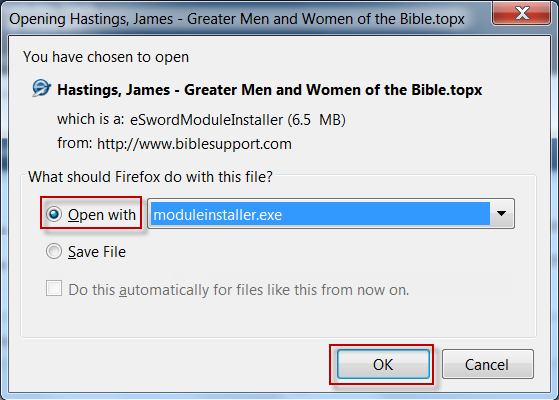 When the zip file opens, double-click the e-Sword module to launch the installer. You can install a module without leaving Internet Explorer! After starting your download in Internet Explorer 9, click Open in the popup at the bottom of the screen. This will launch the Module Installer when the download finishes. You can install a module without leaving Firefox! After starting your download in FireFox, the download popup below will appear. Click the "Open with" option and click "OK". This will launch the Module Installer when the download finishes. Windows 2000, Windows XP, Windows Vista, Windows 7, Windows 8, Windows 10 and maybe older versions of Windows. Special thanks to Brent Hildebrand for help with the installation file, which was was more trouble than the application itself. And special thanks to Doctor Dave and Jon Graef for beta testing. Updated to work with e-Sword's HTML/Apple modules, such as commentary.refi, bible.bbli, reflibrary.refi, lexicon.lexi, etc. I am very frustrated. I am trying to download An Bíobla Naofa, and although I've done everything I've been prompted to, and I keep getting a message that it has been downloaded, I can't see it anywhere on my computer, and there is no way to import it onto my e-sword. There's other ways to install e-Sword modules. But the reason this utility has 20,000 downloads is the majority of e-Sword users are not technically astute. They need a way to automatically copy modules because they barely know what a file is, much less how to copy it, where to copy it to, or even where to find the file (on their PC) after downloading it. They think File Explorer is the same as Internet Explorer. They just aren't capable of copying files themselves. Sounds crazy for some of us. But this is the state of the average e-Sworder. Boy Josh, you described me perfectly. I've lost more files than you can shake a stick at. Or getting a zip file to unlock once its in my download page. E-sword is such a Blessing. Will the installer be available for a MAC computer anytime soon? How can I download it? Brotheren, I am not a computer expert. Can we make a way hat we can have a one button process to download a set of modules just lie my sword for android phones? I believe this will really help. We need to make this available for Laptop and desktop computers. This comment could not be any more true than for myself. I've lost more files and programs and trust me; it's not hard. Just lost another one, thanks to windows 10 update. Thank you Josh for all the Blessings your work brings us. i am unable to fix tamil bible and kannada bibl,e plz help .thnx . PRAISE GOD FOR THE ACCESS TO THIS WONDERFUL WORK OF GOD THROUGH BROTHER MEYER WHO'S MINISTRY LIVES ON TO OUR MODERN TIMES AT THE END OF THE CHURCH AGE TO HELP US SPREAD THE WORD OF GOD TO ALL! I've had this program on my PC for quite some time and have found it to be a very useful tool. The one thing I like about it is that its very straight forward to use, and it really makes copying resources either or both one folder and/drive quite quickly. 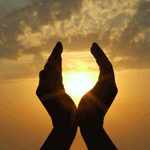 The fact that one is able to customize where one wishes to install/copy the resources makes life a whole heap easier. So, with that, I'd like to thank you, Josh, for this quite handy and useful program. Help E sword Not sure went wrong download complete yet not able to open ?